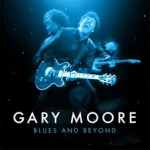 Share the post "Album review: GARY MOORE – Blues And Beyond"
Belfast born guitarist and vocalist Gary Moore was an unparalleled legend, whose career combined hard rock and blues, and at times dipping into jazz fusion (‘Colosseum II’) and a more contemporary harsh sound (‘Dark Days In Paradise’, ‘A Different Beat’). This set compiles is latter blues work with some unreleased work and an official biography by Harry Shapiro to boot. Moore originally found fame with his own band Skid Row, and several stints with Thin Lizzy (including on their magnum opus Black Rose), and guest work (including with Cozy Powell) before blistering the 80s with some fantastic hard rock albums. With the likes of Phil Lynott, Ian Paice, Cozy Powell, Don Airey, Glenn Hughes and Neil Murray playing on his solo work, Moore’s brand of hard rook took the 80s by storm, and the hit Parisian Walkways is still a much played classic. Moore first took (back to) the blues with the guest laden ‘Still Got The Blues’ and ‘After Hours’ (1990 and 1992 respectively), before a Peter Green tribute album before, like Jeff Beck, releasing a couple of more experimental albums. The 2CD compilation part of this set kicks features with the bluesier tracks from that 1999 album ‘A Different Beat’. ‘Surrender’ is a 9 minute track with a gentle blues sound, and a programmed almost ambient rhythm. It’s not the blistering guitar you expect from Moore but the vision is there. 2001’s ‘Back To The Blues’ did what it said on the tin, with tracks here like ‘Enough Of The Blues’, a wonderful song with a harsh in-your-face blues edge. That album is essential listening for any blues or rock fan, Gary Moore or otherwise, and it’s represented well here. The tone of Moore’s guitar matches his passion and vision, and says it all. Also represented well is the ‘Scars’ album (also the band name), a stripped down band featuring Crass Lewis (Skunk Anansie) and Darrin Mooney (Primal Scream). The honest and sometimes more raw sound nodded to the likes of Stevie Ray Vaughan and Hendrix, and the 12 minute ‘Ball And Chain’ here is a solid chunky number that is pure dirty honest blues rock. The set finishes with 2004’s ‘Power Of The Blues’ which saw Moore reunite with bassist Bob Daisley. Another wonderful and honest blues album that really rocks. A wonderful compilation that covers this much overlooked period. It may not have shaken the world like the 1990/92 albums but the music’s just as good. The two extra discs feature previously unreleased live tracks which are the most essential Gary Moore you’ll ever here, along with an alternate version or two. Much of the material is taken from those aforementioned original blues albums, and any album that opens with Gary’s take on ‘Walking By Myself’ and ‘Oh Pretty Woman’ will get your attention. Moore’s guitar screams “listen” throughout. Then there’s an 8 minute take on ‘Need Your Love So Bad’, and ‘Surrender’ takes the pace down nicely, running to 11 minutes. Still got the blues? He certainly does. ‘The Sky Is Crying’ runs to nearly 14, and the rich keyboards balance the guitar well. What also makes the box worth every penny is the book by Harry Shapiro, which not only tells is the story chronologically but features quotes new and old. What bassist Bob Daisley said about Cozy Powell leaving the band during the After The War rehearsals is pure gold. There is a list of line-ups throughout the years, which is good, both for reading and reference, but the discography (for me personally) could have been a little more detailed. As could the booklet info on the source of each track. Minor quibbles on a mammoth and thoroughly enjoyable read. I won’t give any spoilers – If you’re a Gary Moore fan you’ll both want and need this complete set. Apart from the source info and maybe extending the set to include another album or two, there’s nothing not to love about this set. This entry was posted in ALBUM REVIEWS, ALBUM REVIEWS (Mobile), All Posts and tagged album, blues, Blues and Beyond, box set, classic rock, Cozy Powell, Gary Moore, Phil Lynott, review, rock, Thin Lizzy. Bookmark the permalink.